A Photo Booth is fast becoming the must have item for wedding receptions, proms, balls, birthday and Christmas parties. Our party Photo Booth makes for a great addition to any of these special occasions providing a fun souvenir for the guests, who can take their instant and automatically printed photos away with them, and the host who is supplied with a CD containing all photos taken to create their own album. There's also the option of having the photo booth print duplicates of each photo so both the guest and host have a printed copy. The operation of the Photo Booth is controlled by your guests. Once they're comfortable in the privacy of the Photo Booth they can let themselves go! With a single press of the button a sequence of four photographs will be taken a few seconds apart with a countdown and 'Say Cheese' prompt displayed on the Photo Booth screen before each. A 6x4inch print made up of all four photographs is then dispensed from the booth in a matter of seconds for them to take away. We have two different types of photo booth available: the 'Fun Booth' Photo Booth and the 'Deluxe Greenscreen' Photo Booth the later of which can be set to have Wild West backgrounds to the photos if required. Choice of Gloss Black, White Cushioned Effect, or VW Camper style booth body. Choice of side curtain colour. Traditional cloth background curtain to photos. Option for guests to record a video message as well as the photos. Unlimited photo 'sittings' during the hire period with choice of print layout. Guest can select colour, black and white, or sepia photos from touchscreen menu. A CD containing copies of all the photos for the host of the event. Full touch screen control so each individual 'sitting' can choose colour, black and white, or sepia photos as preferred. 'Greenscreen' background themes selectable from range of six different themes via touch screen menu. If required we can set all backgrounds to be Wild West theme so its ties fully to the event. Choice of print layouts with the 6x4in print either split into equal quarters for the four photos taken per sitting, one large image and three smaller images, or two smaller strips of the same four photos to be cut down the middle. A CD containing digital copies of all the photos for the host of the event. Gloss Black, White Leather Cushion effect, or VW Camper design booth with choice of side curtain colour. The photo booth breaks down to be portable and the flightcase it's all contained in will fit through a single door. The photo booth requires an overall operating area of just 9x7ft with a height clearance of 6ft 10in. If the venue is not on the ground floor lift access will be required. Access to a normal 240volt mains electric supply will be required for power. Due to the electronic equipment involved the photo booth must be used either indoors or inside a marquee. If the event is being held during the winter months any marquee must be heated. 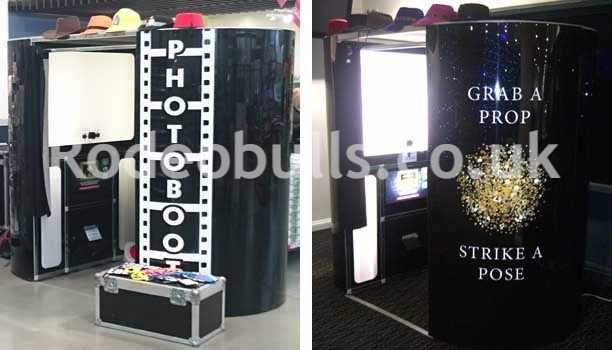 To obtain a competitive quote for the hire of the Photo Booth for your reception, party, prom, or ball, or if you have any queries concerning Photo Booth hire, then please don't hesitate to call or contact us and we will be pleased to assist you.